Zhang Jike training with his dog...? 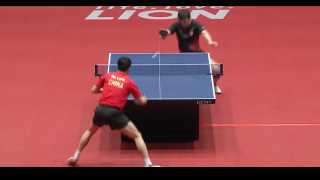 Funny youtube video with Zhang Jike training along side his dog in a China Super League video it looks. Featuring Nippon Life Insurance players HH and MH. Poll: Who's right? Fan Zhendong or Kristian Karlsson? Too bad this isn't allowed. Ma Long, Zhang Jike and Fang Bo having some fun! Ma Long, Zhang Jike and Fang Bo having some fun! This is pretty skillful! Can You play with both hands ? Tomokazu Harimoto leads 10-0 and then this happened! Jan Ove Waldner Bat Breaker! Hey everyone, just watched this again and wondered if you know of any other funny table tennis match videos around? Comedy gold! Funny table tennis sketch! Need cheering up this evening? This is a classic! What other funny table tennis sketches are lurking on youtube?